As with any good Thanksgiving meal, there’s usually a generous helping of something good. In keeping with the spirit of Thanksgiving, we’re dishing out an extra helping of interesting developments in the Canadian online brokerage space. Whatever the equivalent of eating pants are for your brain, we hope you’ve got them on. In this edition of the roundup, we take a look at a very interesting move by a bank-owned online brokerage to become more accessible to younger investors. From there, we’ll take a look at a perennial crowd pleaser – deals and promotions, including one special offer that we spotted being chatted about online. As a bonus, we continue coverage of the celebratory year from another bank-owned discount broker who dropped some very interesting stats on their business and how it has grown over time. As usual, we’ll dish up the latest conversation starters on Twitter and in the investor forums. Bon appetit! Getting into DIY investing just got a little cheaper for some investors this past week. 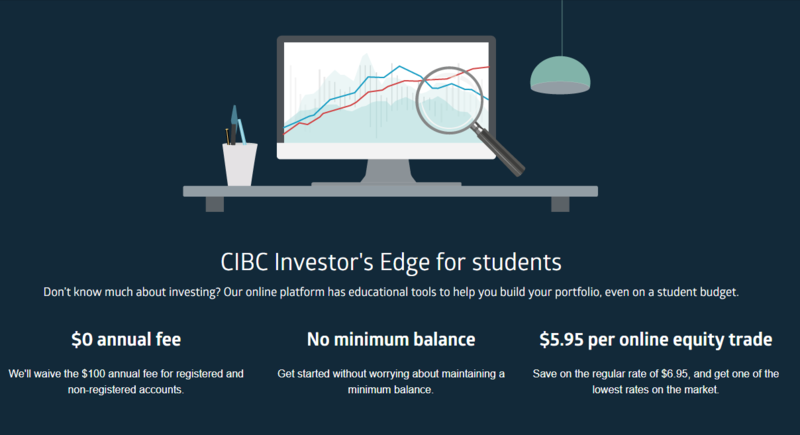 CIBC Investor’s Edge rolled out a new pricing structure geared specifically towards students that offer friendlier pricing and account maintenance terms. The new student commission pricing lowers the standard commission per trade to $5.95 from $6.95 and waives the annual $100 fee associated with accounts that have less than $10,000 in them. While not a novel idea, providing a different pricing tier for students and/or youth does provide some extra incentive to try out a particular brokerage, especially for those new to investing. For CIBC Investor’s Edge, their already low commission rate makes them a natural contender for DIY investors looking to save on commission fees so, for students, who are typically on a budget, this is an attractive option. One important requirement to qualify for the Investor’s Edge student pricing is that individuals have to open up a CIBC Smart Account for students before they can qualify for the Investor’s Edge student rate. Taken together, the fact that only those with student banking packages can access the student commission rates suggests that Investor’s Edge is looking to build a deeper relationship with this (mostly) younger demographic of client. Interestingly, starting a banking relationship with CIBC also opens up the opportunity to get other products, such as a credit card, which a recent Rob Carrick article in the Globe and Mail is an important strategic decision that young people (typically post-secondary students) should consider to build a credit history. While student-friendly pricing may not move the needle right away for CIBC Investor’s Edge in terms of higher commission revenues (except for those riskier clients who like the pot and crypto stocks), the fact this program exists might be enough to tip someone away from a competitor bank-owned brokerage. And, because of the requirements of the student bank account, there is a relatively low cost to using CIBC’s banking services while still getting the convenience associated with a large bank. For other Canadian online brokerages, it will be interesting to see which of the bank-owned brokerages follows suit. Being friendlier to students and younger investors is one way to maintain a relationship with a key demographic. While user experience is key, at some point it’s hard to ignore the cost for services. So, for the non-bank-owned brokerages, there has to be more value to offset the inconvenience of having a separate funding source for an online trading account. An example of an online brokerage getting creative in terms of retention is Interactive Brokers. One way they’ve pursued keeping a tighter rein on their clients has been to offer services like direct deposit and credit cards. Although that service is not available to Canadian DIY investors (yet) the reasoning is similar – the goal is to keep clients from trying out (and potentially liking) a competitor brand. For CIBC Investor’s Edge, they’re hoping that they can build a long-term relationship with a generation in which Tinder is a thing; it will be interesting to see if these new features will have younger DIY investors swiping right to find a good match. The fall crop of Canadian discount brokerage deals is looking a little leaner than usual as we head into October. As mentioned a couple of weeks ago, CIBC Investor’s Edge launched an exclusive cash back offer for SparxTrading visitors towards the end of September and as a result, pits them against BMO InvestorLine as the only bank-owned brokerages (for now) with a cash back promotional offer. This past week, we also had another deal from RBC Direct Investing cross our radar. The offer is for 20 commission-free trades that are good to use for up to one year. 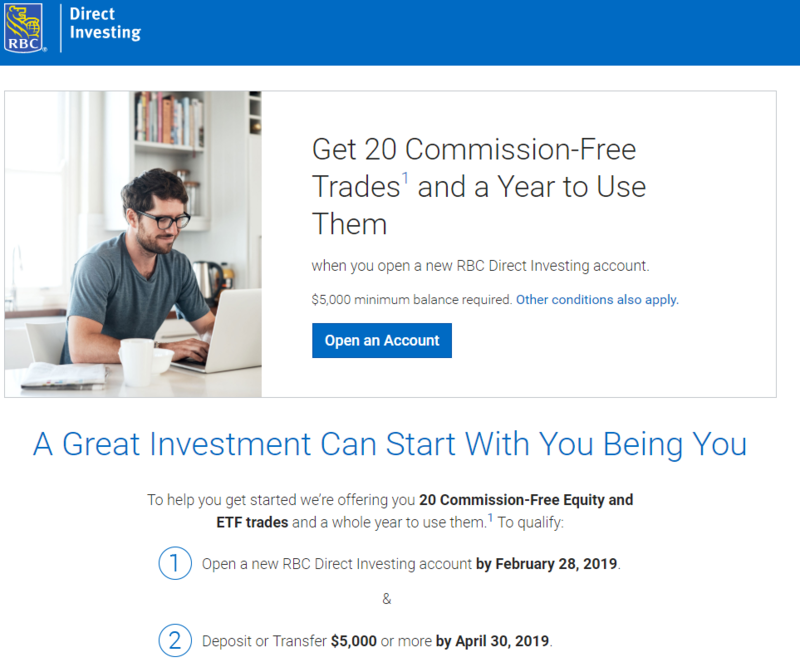 Although this offer from RBC Direct Investing is aimed at healthcare professionals, according to several forum users and looking through the terms and conditions, the deal is technically able to be accessed by non-health care professionals. As we approach the end of the year, there is usually an uptick in activity with respect to TFSA’s and shortly thereafter, RRSPs. An interesting trend at Canadian discount brokerages over the past two to three years is that they are starting sooner in the year with their marketing efforts. The result for DIY investors is not unlike the experience of shopping at Costco where merchandise for Christmas shows up on store shelves in September. Perhaps they’re onto something. For DIY investors in the market for interesting offers in October, the news is somewhat mixed. On the one hand, there’s strong variety in transfer fee coverage and, interestingly, in referral programs. On the other, previously popular categories such as cash back promotions and commission-free trade deals are leaner. That said, these latter two categories still have some strong offers for DIY investors on the fence about the brokerages offering up the promos. With the year now in the home stretch and many financial services providers hitting their fiscal year end, the next several weeks will be interesting to watch. There are whispers of new offers coming to market soon and we are still watching out for the Wealthsimple Trade launch to officially start rolling out which may also create a sense of urgency for brokerages to step up with some interesting offers. There continues to be interesting content emerging from the 30th-anniversary celebration of BMO InvestorLine. Instead of frosting or sprinkles, however, this treat came in the form of interesting data on the online brokerage and how it is reaching DIY investors. Late last week, the president of BMO InvestorLine, Silvio Stroescu, highlighted some of the milestones and interesting stats associated with the online brokerage and ‘digital advice’ segments of the business (aka SmartFolio). One of those stats had to do with the total number of online brokerage accounts, which was quoted at 400,000. For context, the number of accounts at online brokerages in Canada is typically very opaque, unlike their publicly traded US online brokerage counterparts. So, it is interesting to see them share these stats publicly. Further, it was also interesting to learn about the number of SmartFolio and AdviceDirect clients (5,000 and 4,000 respectively). It is certainly a bold decision to telegraph numbers but it does help put into perspective the scale of how fast the online investing space is changing. Given that the number of accounts at the online brokerage unit was quoted as “over” 400,000 that could represent a much higher number, however for some perspective, the waiting list for Wealthsimple Trade stands at just over 76,000 interested parties and they haven’t even launched publicly yet. While it remains to be seen how many of those interested in this account actually open a trading account (and subsequently use it), there is clearly a competitor brewing in the DIY trading segment. Another point highlighted by Stoescu that stood out was the bimodal distribution of the online investing demographic. Simply put, there are “younger” and “older” investors who appear to be gravitating towards online investing via the self-directed platform. There is clearly an interest in the younger tier with upgrades planned by TD Direct Investing also referencing this group and the story mentioned above relating to CIBC Investor’s Edge and the launch of student-friendly commission pricing. Perhaps the most fascinating stat, however, was the reference to the growth of the adviceDirect platform, a service that blends DIY investing with accessibility to support from licensed wealth management professionals. In the period from January to September, they have seen more transfers of accounts worth more than $1 million compared to the past six years since the service launched. While the numbers and specifics are somewhat opaque, it nonetheless points to an interesting level of confidence in the service. BMO InvestorLine has definitely earned quite a bit of coverage in the roundup for their 30th anniversary, however as a milestone year, it appears that there are reasons to celebrate. What also seems pretty clear, however, is that things are changing in the online investing space quite rapidly. Paradoxically, how old a financial institution doesn’t determine how quickly they will grow nor does it determine how well it will handle the future wave of technology-driven challenges. This alone is proof enough that age is just a number. And, for Canada’s online brokerages, it’s also an instructive lesson on staying agile to keep up with the younger generation of investors. How challenging is it to get started with online investing? One “newbie” investor posed an interesting question in this Reddit’s Personal finance Canada thread, drawing a comparison between two well-known passive investing options. Find out where the discussion led, and why so many comments favoured index funds and ETFs. An overwhelmed investor took to this Personal Finance Canada forum seeking direction on which mutual fund to invest in. Willing to opt for a more risk tolerant profile, check out the helpful advice that was offered with some useful links too. That’s a well-seasoned turkey wrap on the cusp of Thanksgiving weekend. This weekend is not really known for self-restraint, so whatever you choose to indulge in, on behalf of everyone here at the SparxTrading.com team, we hope you have a safe and happy long weekend. Just a reminder that Canadian markets are closed on Monday for Canadian Thanksgiving but US markets are open. Have a great weekend!